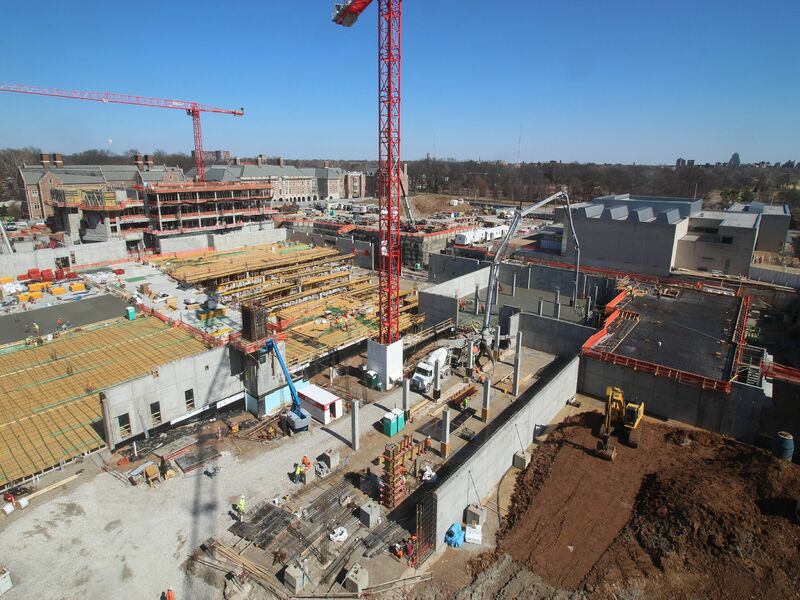 It’s hard to miss the massive construction site on the east side of the Washington University’s Danforth Campus – just a block from the Skinker MetroLink Station. With the help of 170 construction workers, the university is embarking on the largest capital project in history, transforming 18 acres into a front door fit for a world-class institution. The project – dubbed the East End Transformation Project – includes three new academic buildings, an expansion of the Mildred Lane Kemper Art Museum, two new multi-use facilities, an underground parking garage, and a new landscaped entrance to the university including a new park. The Ann and Andrew Tisch Park will be a new gathering place with seamless connections between the School of Engineering & Applied Science and the Sam Fox School of Design and Visual Arts. The park will engage people with first-floor windows, trees, moveable furniture, and arts and sculpture. New landscaping will improve the transition between the historic Danforth Campus and Forest Park nearby, replacing nearly six acres of paved parking with green space and rain gardens for storm water management. Additionally, pedestrians from surrounding neighborhoods and from the Skinker MetroLink Station will enjoy a new, accessible entrance to the university. The Schnuck Pavilion is the final new building, notable for its focus on supporting environmental efforts and cyclists on campus. The 18,500 square-foot building will include dining options, the Environmental Studies Program, and the Office of Sustainability, but it will also be the hub for pedestrian and bicycle commuters, many of whom will also be using MetroLink as part of their commute. There will be shower facilities, lockers, and secure bike parking. An outdoor dining terrace and café will provide an attractive backdrop for pedestrians and cyclists moving through the campus. The entire East End Transformation is designed to achieve LEED-Gold certification and will include solar panels on many of the roofs, high efficiency heat recovery chillers to harvest waste heat for heating needs, and a green roof on top of the parking garage to reduce increased heat and water run off by covering paved surfaces with pervious plantings. Rain gardens, native plantings, and diverse tree canopies will also improve water quality and biodiversity. The bike commuter facilities, bike and pedestrian pathways, and electric vehicle charging stations serve to reduce the transportation carbon footprint of campus visitors. Finally, the East End Transformation Project will improve connections to the campus for public transit users. According to Rose Windmiller, Associate Vice Chancellor of Government and Community Relations at Washington University, the University values its proximity to several light rail stops. Timeline: Construction began in 2017, the majority of the work is scheduled to be completed in 2019; McKelvey Hall is scheduled to open in 2020.